Studies in the 1990s indicate that 7-16% of children with Down syndrome have Celiac disease. That is a 43% greater occurrence of Celiac disease in children with Down syndrome than in children without Down syndrome. Medical literature used to suggest that 1 in 5000 Americans had celiac disease, but in the past decade that number has skyrocketed to 1 in just 133. One might expect an updated study of Celiac disease in Down syndrome to have skyrocketed as well. Celiac disease results when the lining of the small bowel becomes damaged from exposure to gluten, the protein found in wheat, barley and rye. Celiac disease is detrimental to our children and can cause malabsorption which may lead to undernourishment, anemia, osteoporosis and peripheral neuropathy. Untreated Celiac disease can also stunt growth. Due to the high incident of Celiac disease in our children, many families have decided to follow a gluten free diet. Like many things, providing a gluten free diet felt intimidating when we first began. I tried to focus on baby steps… every day or week trying to do something different. First I found lists of grains and foods to eliminate and ones Lydia could eat. Once that was established, it was much easier and less intimidating. We ate a lot of pasta so that was our biggest replacement. Luckily, rice pasta is good and it was easy to find. Lydia ate very few breads, cakes and cookies so we were lucky not to have to find replacements often. I did purchase cookies and kept them in the freezer for holidays, and I always bring our own treats to family parties. I recommend you goto www.celiac.com. It is a great websitewhich includes a section on raising kids with a gluten free diet. The resources are plentiful and are continually updated. You can also find many gluten free products in your local grocery store and many books and websites provide gluten free recipes. Keep in mind, processed food is processed food – even if it is gluten free. While implementing a gluten free diet, try substituting whole foods instead of packaged food wherever you can for an even healthier diet. Nine years ago I had to order products on-line that are now accessible at many local grocery stores. One day I mentioned to my sister the lack of gluten free products in our stores and also the high cost. She found me a buying club in our area that allowed me to purchase gluten free by the case. Remember… it takes a village! Do you have a friend who loves to bake and would help you bake gluten free bread? Do you have a friend or co-worker on a gluten free diet who would share their secrets? Would your sister track down a buying club for you? My daughter, Lydia grew up without many starches and packaged foods. Now that she’s in school and takes cold lunch, we pack almond butter sandwiches a few times a week. Today was the first time I made gluten free bread at home. It was easy and tastes much better than the packaged loaf! It took me 9 years, but like I always say “Do what you can with what you have where you are.” (Ghandi) Today’s baby step was making homemade bread. Last week it was homemade kombucha, a fermented tea. Who knows what’s next! Other products that may contain gluten. Cross-contamination occurs when gluten-free foods come into contact with foods that contain gluten. It can happen during the manufacturing process, for example, if the same equipment is used to make a variety of products. Some food labels include a “may contain” statement if this is the case. But be aware that this type of statement is voluntary. You still need to check the actual ingredient list. If you’re not sure whether a food contains gluten, don’t buy it or check with the manufacturer first to ask what it contains. Cross-contamination can also occur at home. If gluten containing foods are prepared on surfaces such as cutting boards, be sure to clean them properly before preparing gluten free products. Knives and other utensils should also be thoroughly cleaned after using to prepare gluten-containing foods. A Common cross contamination happens when a toaster is used for gluten-free bread and regular bread. Think outside the Starch! Leftovers are great for breakfast! Stir fry, medley (recipe below), chicken and rice all qualify as a great breakfast. Eggs, fruit with nut butter, and protein smoothies also are great. I’ve included a pancake recipe for those that need to start close to traditional breakfast before venturing to other ideas. * Hilhorst MI et al. Down syndrome and coeliac disease: five new cases with a review of the literature. Eur J Pediatr 152: 884-887, 1993. * Jansson U & Johansson C. Down syndrome and celiac disease. J Pediatr Gastroent Nutr 21:443-445, 1995. * George EK at al. High frequency of celiac disease in Down syndrome. J Peds 128:555-557. April 1996. * Gale L et al. Down’s syndrome is strongly associated with coeliac disease. Gut 40:492-496, 1997. * Carlsson A et al. Prevalence of IgA-antigliadin antibodies and IgA-antiendomysium antibodies related to celiac disease in children with Down syndrome. Pediatrics 101(2):272-275, Feb 1998. * Pueschel SM et al. A prevalence study of celiac disease in persons with Down syndrome residing in the United States. Acta Paediatr 88:953-956, 1999. * Zachor DA et al. Prevalence of celiac disease in Down syndrome in the United States. J Pediatr Gastroenterol Nutr 31(3):275-9, 2000. * Jason SR et al. Celiac disease. Current Opin in Gastroent 17:118-126, 2001. * Agardh D et al. Tissue transglutaminase autoantibodies and human leucocyte antigen in Down’s syndrome patients with coeliac disease. Acta Paediatr 91:34-38, 2002. * Hill ID et al. Guideline for the Diagnosis and Treatment of Celiac Disease in Children: Recommendations of the North American Society for Pediatric Gastroenterology, Hepatology and Nutrition. J Pediatr Gastroenterol Nutr. 40:1-19, Jan 2005. * Hanson T et al. Antitissue transglutaminase and antithyroid autoantibodies in children with Down syndrome and celiac disease. J Pediatr Gastroenterol Nutr. 40:170-174, Feb 2005. * Nisihara RM et al. 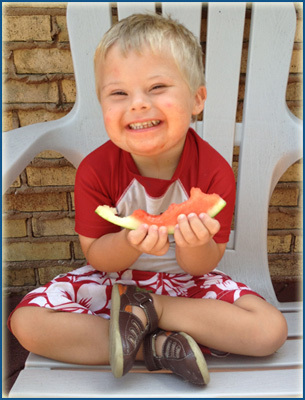 Celiac disease in children and adolescents with Down syndrome. (Brazilian study) Jornal de Pediatria, 81:373-378, 2005. * Swigonski NL et al. Screening for celiac disease in asymptomatic children with Down syndrome: cost-effectiveness of preventing lymphoma. Pediatrics. 118(2):594-602, Aug 2006. * Shamaly H et al. Tissue transglutaminase antibodies are a useful serological marker for the diagnosis of celiac disease in patients with Down syndrome. J Pediatr Gastroenterol Nutr. 44(5):583-6, May 2007. For recipes, check out the recipes tab under "Diet & Nutrition" in the menu above.